​Maybe we misunderstood ​Antonio Brown's intentions the whole time? The Steelers star has repeatedly hinted he wants out of ​Pittsburgh, even going as far as to ignore Art Rooney II's requests to speak over the phone. 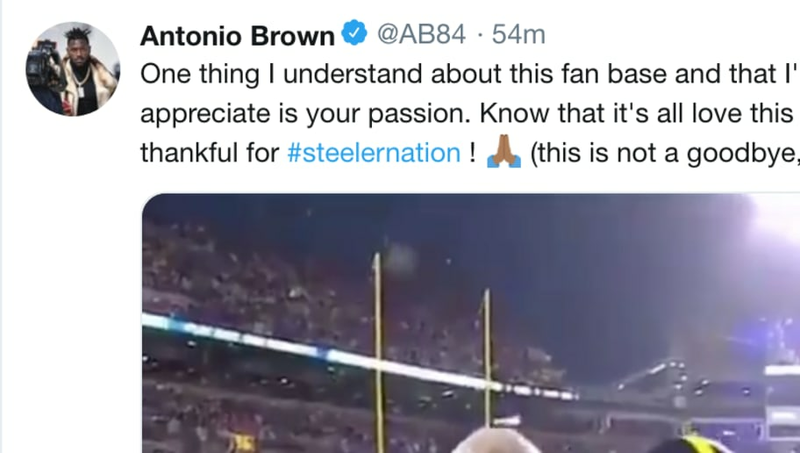 With the Steelers taking calls on Brown ahead of the NFL Draft, AB took to twitter to thank Pittsburgh supporters for years of service. And he made it clear--this is not goodbye. This is a smart PR move for Brown, who's probably been instructed by his agent to try and restore the good faith he'd built up with the Steelers fan base. Of course, any hope of a simple resolution is all but gone given Brown's antics with James Harrison over the past few weeks. But for appearance purposes, Brown doesn't want to completely burn his bridges in Pittsburgh (and there are a lot of them, trust me) should the Steelers trade him this offseason. Brown's future in Pittsburgh is still up in the air, but this is surely a good sign for those in favor of keeping the Pro Bowler around, rather than losing him for draft picks.